Along with patterned shirts (which I feel like I've talked about far too much lately! 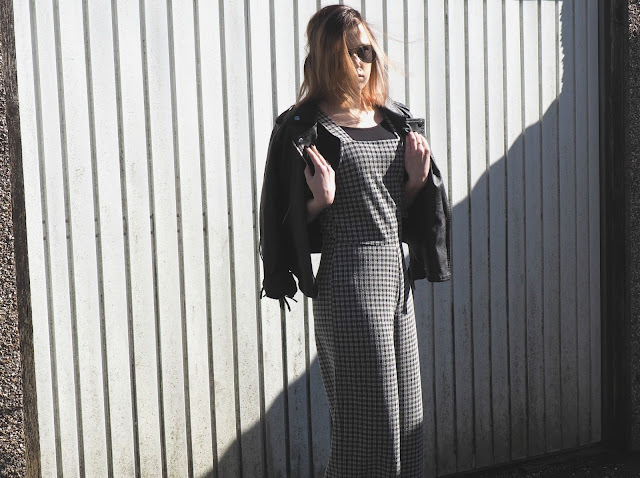 ), another of my recent obsession is dungarees/jumpsuits/playsuits. Basically all-in-ones that are easy to throw on but still look stylish. This isn't so much of a new obsession though, I've been slowly growing a dungaree collection since early last year, maybe before then even? They're so versatile and easy to style up or down and just make a nice change from ordinary jeans/trousers! I picked up this pair from Zara last month and they're the bomb tbh. I'm really enjoying the culotte trend at the moment so they fit perfectly, plus, the monochrome pattern is deal. (For me and my love of all things monochrome anyway). They're super stretchy and really flattering to wear, although my mum did say "I thought they were supposed to more cropped than that? But I guess they are on someone of normal height". She's such a flatterer! So I guess if you are of average (or greater) height then they'll show off more ankle/calf flesh than on me! Fan of a jumpsuit or dungarees?